Bloomsdale Longstanding (48-55 days) OP - Heirloom variety introduced around 1908. Resists bolting. Dark green crumpled leaves. Standard of spinach. Malabar (85 days) OP - Vigorous climbing vine that produced thick leaves used for salads or cooked and eaten like spinach. Best trellised. 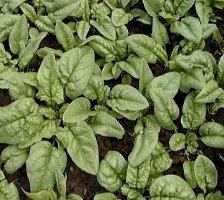 Viroflay (50 days) OP - (Monster Spinach, Giant Spinach) - Smooth dark green leaves. 19th century French Heirloom. There is great diversity in the vegetable varieties that we offer; which makes the general information provided only valuable as adjustable guidelines. This may also affect your seed planting and propagation strategies and the germination rates under your planting conditions may vary from the seed lot test results. The following soil temperature data is for spinach in general. Temperatures are average daytime from planting to emergence. Percentage is average germination rate. Days is number of days to emergence.